The latest film from French Director Jean-Pierre Jeunet (Delicatessen, City of Lost Children, Amelie) once is again full of the type of whimsy that the director has become famous for. A young boy, Bazil, loses his father to a land mind; later, as an adult, he’s hit by a stray bullet while tending to his station in a video store. The bullet becomes lodged in his brain, leaving him susceptible to death at any moment. Due to the accident he loses his job, becomes homeless, and falls in with a troop of underground salvagers who restore discarded junk. One day, while hauling some salvaged scraps home, Bazil drives past a pair of buildings – arms merchants, both, responsible for the land mind that killed his father as well as the bullet in his brain – and hatches a plot to extract his revenge. The underlying subject may seem both serious and timely – the arms merchants supply weapons to wars around the world, including terrorists and the states combating them. But MicMacs wants instead to revel in a comedy of underlings scumbling about to combat powerful bad guys (the CEO’s of the two companies). Essentially a Clay Shirky “Here Comes Everybody” treatise on the power of the individual to take down the corporation (the original translation of the title means “non-stop shenanigans”), MicMacs has our heroes assemble a series of intricate Rube Goldberg devices and improvisational theater out of salvaged parts and recirculated clichés, all to attack what the bad guys hold most dear (their possessions) and extract embarrassing confessions. Jeunet’s style, ever so entertaining, is once again to pull together a Dada-ist ensemble of circus-like characters (including a contortionist, a human cannonball, and a woman who can measure distances and speeds by simple observation) along with flickering montages of seemingly re-used film clips and illustrated flashbacks. I found the effect of this film startlingly refreshing. 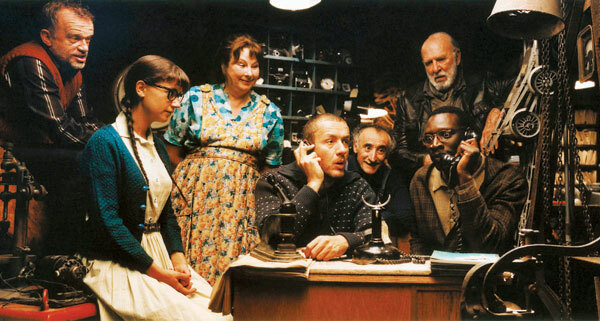 Jeunet has been doing his art-house/clown-like approach to film for a while, but when you compare this movie with other contemporary fare (whether it be the serious animated melodrama of Toy Story or the knowing earnestness of film-festival favorites like Holofcenter or DeFelitta), the difference in approach and tone is dramatic. Where much of film these days has taken on a life-or-death seriousness, Jeunet insists on finding the play and whimsy even in the most serious of subject matters. That’s a strong point of view to hang out in the wind against the prevailing zeitgeist, and you may, as I did, really appreciate it. In comparison today’s self-serious fare, MicMacs may seem lightweight and even a bit silly. But it’s a very smart and calculated silliness – one designed to tickle our sense of life-and-death propriety (even the doctors operating on Bazil’s bullet take time to wax philosophic), while at the same time allowing us to indulge in our heroic revenge fantasies. It’s precisely this break from convention that makes this movie so satisfying as well as entertaining. In the end, Bazil and his new-found friends enact an almost “Mission Impossible”-like dramaturge designed to extract their revenge on the two hapless CEO’s (who are both natural enemies as well as compatriots). When Jeunet reveals the set-up, he does so with the usual flair for amusing re-enactment, and the gag is well worth waiting for. In the end, Bazil has his revenge, as well as a new family – indeed, he has his life back. Since it’s at the expense of both CEO’s, Jeunet seems to be implying that this is a zero-sum game: that there are winners, and losers, and often power makes the difference. This time, YouTube makes the difference, and the final sequence of amused web surfers is Jeunet’s most “realistic” portrait he’s given us of our modern world to date. Jeunet has always been the champion of the ordinary guy, a clown who wants us to understand the pathos and joy in the bumblers and the castaways, a giddy populist railing against the fat cats. This film is no exception, but perhaps, finally, events are catching up with him.